I have stacks and stacks of old Bon Appetit magazines that Chad would really love to see me toss in the recycling bin. I’m nowhere near being a hoarder and sure just about all of their recipes are online, but every now and then I really crave thumbing through an old paper issue and picking out something fun to make. Today was just such an occasion. I wanted to share some of the things I’ve been canning with my awesome coworkers so I was on the hunt for some sort of bread item. 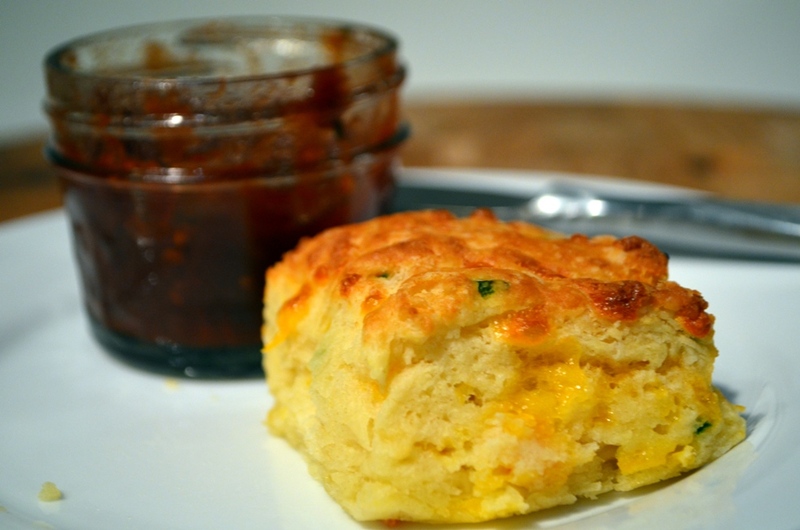 Jalapeño-cheddar biscuits would be perfect! I also had several jalapeños leftover from last week’s trek to the farmers’ market so coming upon this recipe was just serendipitous. The original recipe can be found here. Below, I’ve recreated it with a few modifications. Prep all ingredients by measuring out all dry ingredients, cutting butter into chunks, chopping jalapeno & shredding cheese. 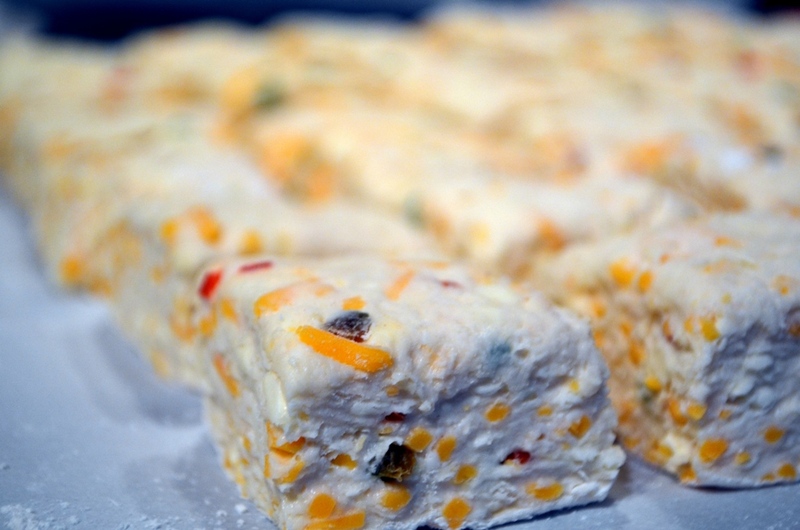 Put the butter & dry ingredients in the freezer for about 10 mins. Preheat oven to 450°F & line baking sheet with parchment paper. Combine first 4 ingredients in food processor. Add butter & pulse until mixture resembles very coarse meal. If you don’t have a food processor you can simply do this step with a couple forks, knives or your fingers as long as you don’t melt the butter. 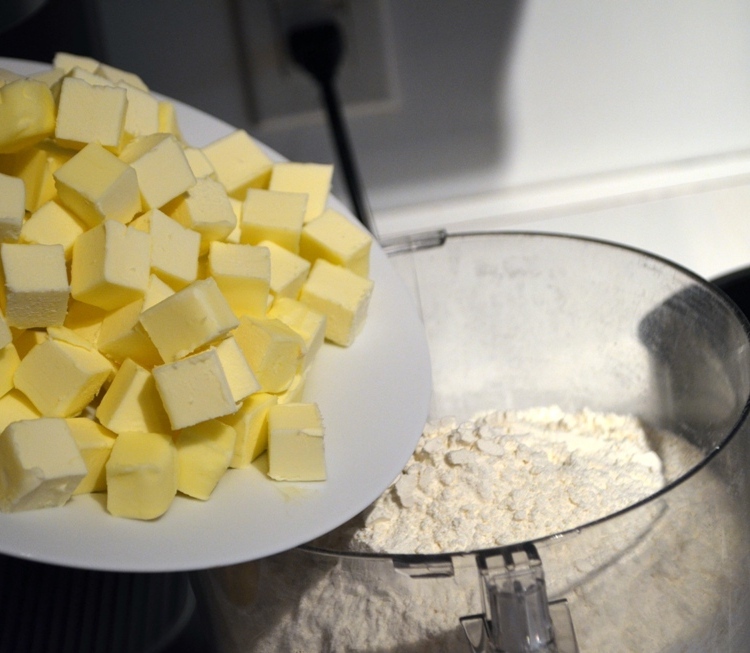 The longer the butter holds solid form, the higher your biscuits will be. 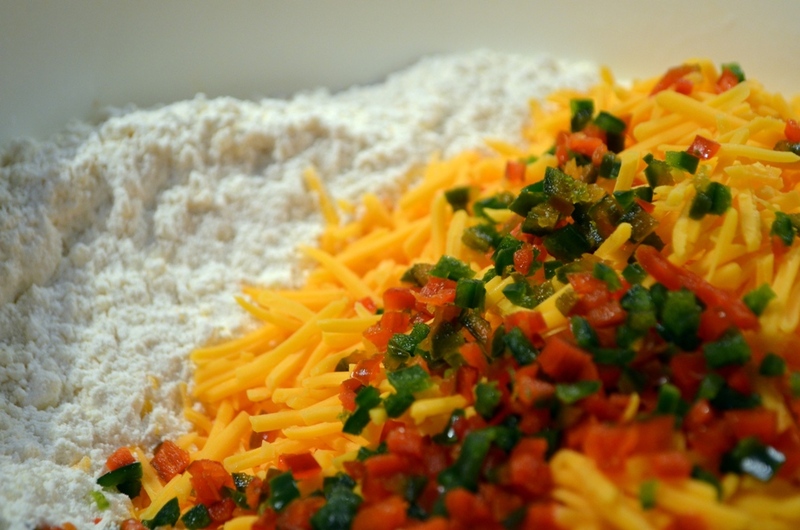 Dump mix into a large bowl & blend in jalapeño & cheese. Stir in 3/4 cup buttermilk; toss to moisten evenly, adding more buttermilk by tablespoonfuls if dry. Gently gather dough into ball. Transfer to lightly floured surface and gently pat slightly flat. Knead 3-4 times and flatten with your hands (NOT a rolling pin) to a rectangle or square of 1-inch thickness. The less you stir and handle the dough, the lighter and fluffier your biscuits will be. Cut into 2-inch squares with a large knife or biscuit cutter. Gently gather dough scraps; reshape and cut out more biscuits. Arrange biscuits on prepared baking sheet about 1/2 inch apart. This will help them to rise higher and have softer sides. Bake biscuits about 12 minutes until puffed and golden on top. These are best served warm. Perfectly golden-brown biscuits–it was sooooo hard to wait for them to cool a little! Going to take these to work in the morning. We’ll see how the ladies & gents like ’em! yum! looks great for a morning snack! Yeah, they’re actually great just about any time of day. Of course, with 1/2 Tbsp of butter in each one it’s a good idea to freeze most of them to enjoy later. Success… from the feedback I got, the folks at work loved them! Of course, now I may have set a wicked precedent. Thanks, Andrea! I’m eager to hear your thoughts if you try it. So good! Next time, I’m adding more thyme, more red pepper flakes & a bit less cinnamon.